This show really works because all the traditions are there but with some delightfully creative twists. For example, it is good to see the beanstalk having a character of its own. A UV transformation scene reveals its moving face and it even gets its own Little Shop of Horrors-like song. The giant was impressively worked by Dean Burne and credit must also go to the surprise appearance of the dancing cockroaches. The young performers’ faces and moves were spot-on and a brilliant addition. Richard Morse is every inch the evil Fleshcreep and Kraig Thornber seems equally at home as the Dame. The romance between Kerry Newell and Maya Grant is not exactly overwhelming, but both prove themselves in the Giant’s castle scenes. 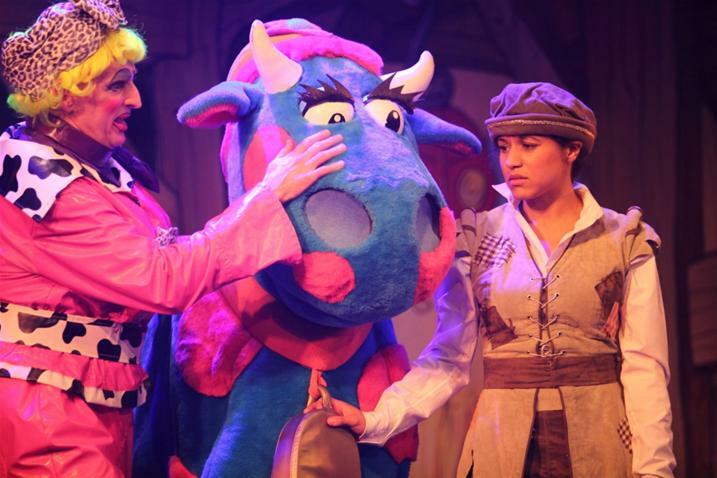 Mike James has returned as the comedy fool, Niki Smith is a particularly enthusiastic Fairy, while Daisy the Cow boasts to be the nation’s favourite and is ably manoeuvred. The overall appearance of the production is very much helped by the first-rate sets, which have plenty of comic book style and perspective. There are plenty of musical numbers and although some seem dated, the audience participation song based on beans is nicely original. There is much to see and hear for very young audiences in this confident pantomime that understands what it takes to entertain.